(hair aside) she looks a lot like me. And even more freaky, her sister Hannah looks a lot like my sister. Now that the season is almost over and she’s skinny and hot, people have come out of the woodwork to tell me how much we look alike. I’m pretty sure they all noticed before and chose not to mention it until now. I have smart friends. Anyway, on an episode a few weeks ago, Ali Vincent (a previous winner) came for a visit. She did a kitchen segment where she made this quinoa salad that I thought sounded pretty good (not gonna lie, not all of that Biggest Loser food does. Cutie pie Curtis Stone can only do so much without oil and salt…) And I had just finished prepping this post all about quinoa. Perfect timing! It’s really simple, really healthy, and works great as a main dish or a side dish. Check it out. And some gorgeous chopped bell pepper. And if you have to sell your first born to be able to afford a fresh red bell pepper right now, you could substitute some jarred roasted red bell peppers, or even a couple of diced tomatoes. Add some sweet, juicy mango. FYI Whole Foods Market has awesome Hatian mangoes in stock right now. That’s what I used and they were deeelicious. 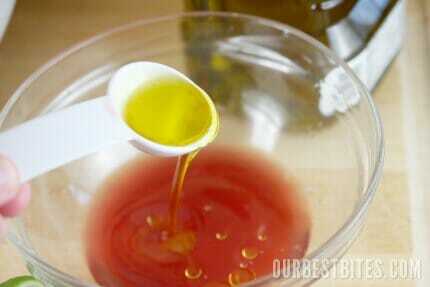 In a separate bowl, whisk together the quick dressing. Juice a half of a lime, or a whole lime if you’re a lime-y kinda person like I am. Whisk it all up and pour it over the salad and then give it another good toss. Now this is where I would get kicked off the ranch. Because on the ranch we all know that salt is evil. Unless you’re trying to throw a weigh-in and then it’s awesome. But I think at this point the salad needs a generous sprinkling of kosher salt and fresh ground pepper. Don’t tell Bob. Chill before serving so all of those yummy flavors can party it up. 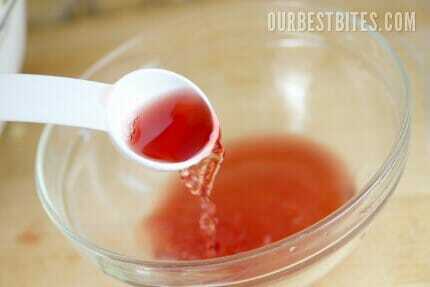 Or do what I did and spoon it over grilled chicken. It would also be great over grilled fish (or so I would imagine. That looks so refreshingly summer! I can’t wait to try it – I’m even willing to swap my first born for that gorgeous red pepper! This looks so colorful and delicious! I love quinoa and have been eating warm quinoa dishes over this past winter… Now it’s time to make cold quinoa salads like this one! Thanks for the fabulous recipe! Beautiful salad. I love how colorful it is. I’ve been meaning to give quinoa a try, I may start with this recipe. I don’t know how I missed this episode (or at least the recipe part of it) but this salad looks fantastic! I LOVE quinoa, and mangoes, and just about everything in this salad… looks like I know what dinner is tonight! YUM-O! You probably fast forwarded it like I usually do at those parts, lol. I can’t wait to make this one! Perfect for summer! I just love you Sara! Your post bio’s are so funny and entertaining. Biggest Loser is my fave show too, and the purple sisters to boot! – It has to be one of the best seasons yet! How lucky you are to look like Olivia – you’re both Gorgeous! PS – how about a post on a great oatmeal cookie recipe – lower in fat (no shortening please) and full of yummy things like vanilla, coconut, raisins, nuts, spices etc. I’m still debating about which is best: old fashioned oats or quick minute oats in oatmeal cookies. I searched the website for an oatmeal cookie recipe and couldn’t find one. How about a Mac-n-cheese recipe too? Couldn’t find that recipe either. This is another great mac & cheese recipe. I even tested it on my son & his friends & they all enjoyed it. 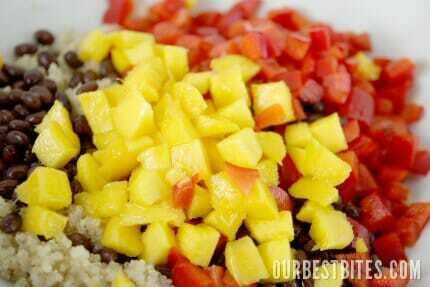 What a lovely combo of flavors for a quinoa salad! This looks so light, refreshing and just delicious, Sara! Not to mention simple. Thanks for sharing! This looks gorgeous, fresh, healthy and delicious! I will be making it soon. You gals rock! I LOVE the Biggest Looser. I have been watching it for several years and am soooo addicted. And I too love the sisters! They are so funny! I have last night’s episode DVRed and am excited to watch it tonight. 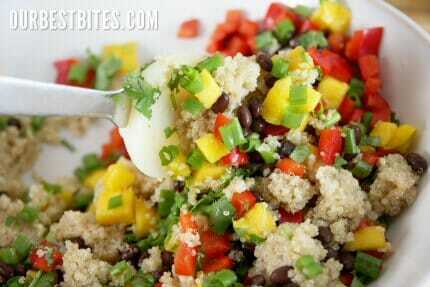 Oh and this quinoa salad looks tasty. I have been on a real quinoa kick lately and have been attempting many new recipes recently. I even did my own write up all about quinoa about a month ago and shared a recipe Carrot, Tomato, and Spinach Quinoa Pilaf! This looks so easy. The only problem: I live in a tiny town and the grocery stores have a limited selection of produce. Maybe I’ll find more good stuff once the farmer’s markets get going again. Bummer Erin! But you could totally substitute just about anything in there. Even the mangoes could be something sweet like peaches or pineapple. I’m on team Olivia too. Love that show, I cry almost every week. What happened to Michael, The Italian Stallion, from 2 seasons ago? We loved him! Oh this looks fantastic-it’s supposed to be beautiful and warm next week-this is so going on my grocery list! This looks amazing! I’m so glad you posted it; I’ve really wanted to try cooking with quinoa and I think this will be a great place to start. P.S. Olivia is my favorite too. That girl rocks. New food scares me. Anything (except hibachi grill and Vietnamese egg rolls) that sounds like it could have come from anywhere in Asia or Africa makes me shiver and I put an automatic stamp of “NO WAY” on it. That being said, this salad looks like it could be super delicious and I’m so tempted to try it! And that’s because I have never made something from this blog that looked super delicious that my family didn’t just love to the point of no leftovers. … And I may have laughed a lot about the haiku. My brother just invited my family over for dinner on Friday night and I bet this would go great with his smoked chicken! Yum! Thanks for making my side selection easy! I’m so thrilled to have this recipe! I saw Ali make this on the show and immediately after watching I went searching on the internet for a recipe. Never found one. Thank you so much! THANKS! I actually have all those ingredients! It’s a miracle! I also think Olivia is my favorite, although I really want to see Jay go far. Love that show! You have done it again. Every time I buy a “new” ingredient thinking that I will figure out how to use it, you tell me how! I just bought Quinoa 2 weeks ago, didn’t have a clue how to use it, now I do! 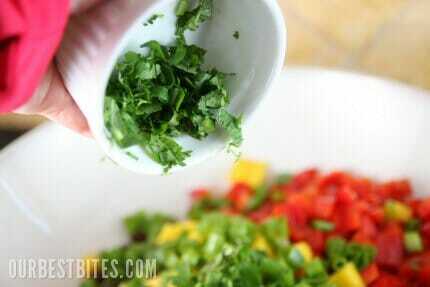 I’m going to get me a mango and pepper and try this salad soon. Thanks for sharing!!! This taste great! Thanks for the awesome recipe. This looks super good but…..I’ve been waiting with baited breath for the second half of the Chocolate Cake post! 🙂 It felt like torture that you gave us only half of the recipe and for me, Wednesday couldn’t come soon enough to get the second half of it!!! What recipe are you talking about Carrie? Both parts of the chocolate cake recipe have been posted last week- did you miss it? A. I am totally going to make this. B. You do look like Olivia or maybe she looks like you………..Go Purple. Thats so funny, I have thought since the beginning of the season that Olivia looks like you (or vice versa). She’s definitely my favorite. This salad looks amazing. I’ve just recently been trying quinoa in some recipes so I’m glad to have a new one to try. The first one was out of the joy of cooking cookbook and it looked good and in reality was good but it just didn’t have quite as much flavor as I would have liked. It was some sort of stuffed acorn squash or something like that. I know that flavor won’t be a problem with you though. Thats one thing I can always count on. lol. I really appreciate that about your recipes. OMG Sara… EVERY ingredient in that salad looks refreshing, yummy, and delicious…EXCEPT for the quinoa. I have no idea why I’m so frightened to try it. Probably because it’s small and round… like cous cous… which sets in MY gag reflex. I love rice (especially short grains like Arborrio), but this doesn’t physically appear like it would have the consistency of rice at all. Maybe it’s because it’s so healthy, and healthy grains usually seem to be really dry. I really do wish I could get over my fear, because this recipe ROCKS! long as it tastes divine. OMG My SO yells that I am the Biggest Loser watching The Biggest Loser eating ice cream etc. The Biggest Loser is my favorite show. I hope Irene beats Jay and the sisters for the top prize. Thanks for sharing the recipe. It was perfect with the taco chicken. The only complaint that I has was I felt like the dressing was way too strong and almost unnecessary. Did anyone else feel the same way? I am going to try it next time with just a little olive oil and lime and see if that is any better – but loved the mango and quinoa together! That’s interesting Erin because I thought it needed *more* flavor which is why I ended up adding lots of salt and pepper at the end! Out of curiosity, did you cook your quinoa in water or broth? this looks amazing!!! i can not wait to make it for my family. We have been trying out many of the recipes i am finding here and they are all turning into new family favorites. 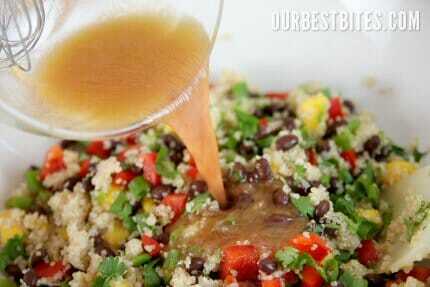 I made it with the broth and I loved the flavor of the quinoa. The vinegar just seemed really overpowering- I may have also used too much lime juice. I will definitely be trying it again! Have you heard of Chef Brad? He’s pretty famous here in AZ and he just landed a cooking show on BYU TV and his first episode was on quinoa! Made me want to try it. now I have your recipe to try too – SCORE!! Thanks a million. Have been follower for years and love you gals! I love The Biggest Loser and after I saw this episode I thought we are making that. We eat quinoa in our house at least 2-3 times a week and any time you can dress it up then it is awesome. I love the idea of adding some salt to it. I will have to do that. Olivia is my favorite too. I love how her husband lost so much weight while she was gone. I think that those two will never gain it back because they have the support of each other unlike many couples where the spouse is large too. She deserves to win and yes she looks hot on her facebook page. You and Kate are the best. Oh yes and I use your cookbook at least 3 times a week. Thanks for making food so yummy in our house. Read this post yesterday and made it for dinner. YUMMY!! So, so good. Thank you so much! We also tried it with a little toasted coconut. That was good too. I too, am scared to try new things. I loved couscous when I tried it, but struggle to remember to use it in place of rice, etc…You just have to get something into your thought process, I guess. Just wanted to pipe in & say I bought quinoa for the very first time this weekend after reading your cooking tips. I have been wanting to try it for a while now & that gave me the nerve to try it. Can’t wait to cook it up. Trying mine (cooked in broth) with roasted red peppers & zuchini as that is what we have on hand. Can’t wait! Love your blog, just made (my fav) spicy honey glazed chicken Monday night, yum! Also a BL fan, my pick is Irene or Olivia. Out of curiosity where is Whole Foods Market? I live in Boise, too, but couldn’t find an address online anywhere. This looks delicious…I think I may have to try it ASAP. Patricia, Whole Foods mailed me some mangoes, but I’m SO happy that they’re building a store here soon! It’s going to be down town, right across from Julia Davis Park. I actually passed the site today with the sign and got all giddy, lol. Thank you so much for this recipe! My new baby has an intolerance to dairy, soy, and nuts, so I’ve been going CRAZY with these limitations in my diet. This recipe was posted at the perfect time for me. I have never eaten quinoa before, but I love all the other ingredients so I’m betting this will be AWESOME! I just made this for dinner and served it with Mahi mahi and homeade pitas (all recipes peppys pita. I made it without a breadmaker). Very flavorful! It was really tasty stuffed in the pita, it could be a nice lunch. I’m so glad you posted this….I wanted the recipe when I saw it on biggest loser. Thank you for another great recipe! Thank you for reminding me I love quinoa! I went through a phase a few years ago and made it frequently, but haven’t touched it in months. When I saw this recipe, I knew I wanted to try it again. I made this for dinner, and it was delicious. I used pineapple in place of mango, 1/2 red and 1/2 orange peppers (for color) and even my kids inhaled it. It’s so light and summery, and the colors are amazing, which makes me love it even more. Yum!! Loved this…thanks for the yummy recipe! Loved this…thanks for the yummy recipe. It has perfect summertime flavors. I was just introduced to your website, and have to say I’m impressed! Food has always been fun and interesting to me, and I love trying new things. Lately I’ve been adding Indian (from India) spices to my pantry and trying very new (to me) foods. I love it! Quinoa has been part of my pantry for several years, and when I saw this recipe, realized I had almost everything I needed, so I ran to the store and unbelievably found a ripe mango! This was quick and so easy to make, and I couldn’t wait for it to cool until I had some. 🙂 It is great! After my first taste test before declaring it finished, I added 1/2 large jalapeno (the big ones have very little heat, but a bit, and a good flavor), minced, and have to say it added a wonderful bite. Thank you so much for the yummy lunch, and new addition to my recipe file. I’ll be buying your book, as well! This looks delicious! I think I’ll make some this weekend and save the leftovers for lunches next week in my Laptop Lunches bento box. I love my bento box so much that I’m actually thinking about what to make for dinner based on the leftovers I’ll yield for my bento box! Yes, I understand that’s a bit nutty but you should really check out their products. They make eating healthy fun: http://www.laptoplunches.com. This was really good. My little boys loved it and were asking for seconds. Also, I soak my quinoa in a bowl of water during the day as it begins to sprout even if you can’t see it and increases the nutritional value of this super food even more. Thanks gals! I made this last night for company where one was a vegetarian. I had no idea how it would turn out (why do I always “test” my skills when company is coming???) and as soon as I pulled it out of the fridge she said “OH QUINOA!!! !” and I new I made the right choice. It was amazing! For the veggie eaters and the meat eaters alike! 🙂 Thanks! Made this tonight. So good. I replaced half the water with mango juice. Worked really well. Next time I might add a finely diced jalapeno pepper for some kick. I just made this tonight and I loved it! It’s so refreshing. I love the combination of all the flavors. Thank you for the recipe! This reads like a list of my favorite foods – I made this for dinner and absolutely loved it! The flavors were beautiful together. I did add a touch of salt and pepper at the end, but for me it almost didn’t need it. I cooked up the quinoa with chicken broth and it was delicious. It was my first introduction to quinoa and I’m feeling a little obsessed about it – SO yummy! Thanks for the post about preparing it, too – by some experimenting I did, I could tell that rinsing/soaking it makes a big difference in the flavor. Love the Mango Salad Recipe….Love that beautiful Silver dress…U look Great. We’ve been tasting your blog recipes for a few months now…they’ve been delicious. Today we had this for lunch and my husband and I both loved it. Thanks for sharing your talent! Ok, so I accidentally left this comment on the “how to cook quinoa” page, but I wanted to let you know how much I enjoyed this recipe as inspiration. This was a perfect side for tonight’s grilled chicken. Only I didn’t have most of the ingredients, but with your recipe as a starting point, I totally winged it! I used quinoa, corn, a peach, tomato, fresh chives, a few cilantro leaves, fresh chives, and a drizzle of pomegranate balsamic vinegar and eureka lemon olive oil (from allspiceonline.com). Delicious!! Thanks! I just shared this with 2 coworkers for lunch and we all loved it! And as a single mom with full time work and part time school, I am thrilled that it’s such an easy make-ahead take along meal. Thankyou!! I bought some quinoa 2-3 years ago in Denver & Salt Lake City. I paid $2-3 per lb. Yesterday, I went to our local stores (small town, 3 grocery store) to buy more. It was ~$7/lb(organic), so I used what I still have at home). Where are more reasonable sources? By the way, I made the salad & everyone who tried it enjoyed it immensely. If you have a costco membership it is $8 for an organic bag…I think its at least 2-3lbs. 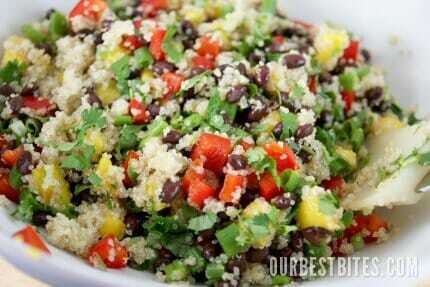 I can’t wait to try this quinoa salad – looks very yummy. I made this tonight. It was delicious! It reminded me of cowboy caviar, so I thought I’d try it on tortilla chips. It was really good! The mango added the perfect amount of sweetness. I think next time I will 1 1/2 times the dressing. I thought it was lacking in that area. Thanks for the recipe! 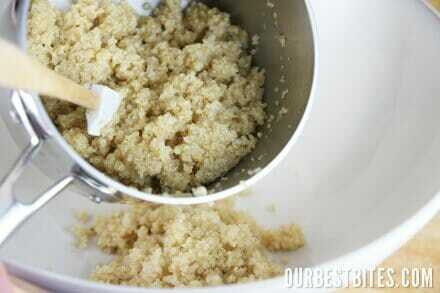 Love quinoa and can’t wait to add this to my salad collection. Is there a way to print the text only on your older recipes? Am I not seeing the “print this” option? I made this tonight and it was delicious! Thank-you so much. I made this tonight. It is the best quinoa recipe I’ve ever tried. It is so good. Thanks! P.S. I added avocado to mine (because I’m in love with avocado). Yum! I loved this! I think it needs more mango though. Next time I will use two. I love mangoes! Thanks! I went out on a limb and made this with peaches instead of mangoes because that is what I had on hand… and it was awesome! I roasted the red pepper on the grill and even my skeptical husband loved it!! Definitely will make again…over and over again! Mmm, made this for lunch today and had leftovers with dinner, as well. 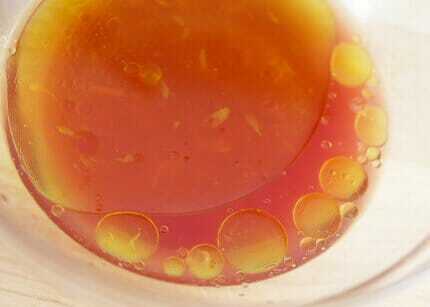 Added a bit of honey to the dressing to make it more enticing for my kids, and it was a winner! Woah. This is so delicious. It is colorful, summery, and has such a unique and light taste. I can’t wait to make this for my mom and mother-in-law! I made a huge batch of this to eat for lunch all week and I can only say one word: FABULOUS! I love the medley of flavors! I had never used mango before in any recipes (I hadn’t even bought one before!) and it perfectly complements the other flavors in the salad. I am one happy camper after lunch now 🙂 I ran out of limes so I used a lemon instead and the dressing was still great!! Thanks so much for sharing! Wow! This stuff is a party for the mouth. I only used one Tbs evoo and used a tomato instead of bell pepper. Not a real hit with the kids but I don’t care, because I’ll eat it all! I could definitely see substituting pineapples or peaches with the mango, but I think I like the mango. Thanks for the recipe! So I just made this. Yummy. I have wanted to make it since I saw it on biggest looser. I love it. I haven’t even let it sit for an hour yet and am already eating it. I am making it for a big dinner tomorrow so it will sit all night. I am so excited to eat it tomorrow. I doubled the recipe and it made a very large bowl. I guess if people don’t eat it then Sunday I am making fish and we are eating it with it. This is de-licious, and even though my kids wouldn’t eat it (or the tortellini bake, or taquitos… SIGH) I will be making it all summer long. So flavorful and summery. I used frozen mango chunks that I thawed and diced and they worked perfectly. This is a very good idea with the frozen mango chunks. I’m gonna get me some of those. This is delish. But….being the mango lovers we are we doubled the mango. Really really good! Loved this! The vinegar was a little strong for me, so next time I would only do half. Just stumbled across this blog last night (thanks to a post form Money Saving Mom’s blog) & I am lovin’ this site. 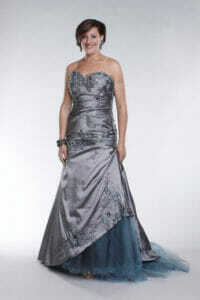 I just started watching Biggest Loser (I’m a little late in the game ~ have been watching it On Demand). I saw the episode where Ali made this recipe & it looked so delicious, but I had no idea what quinoa was. I am so glad you took the time to explain what it is. Quinoa is now on my grocery list & will be purchased today. Can’t wait to try this recipe! So I made this the other day – DELISH! Thanks so much for sharing! 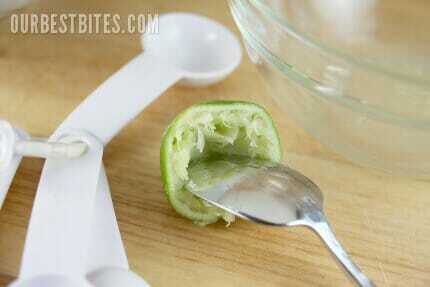 I think my lime was a little strong, and I added 2T, so next time I would cut down on that. But, seriously, the BEST quinoa dish I’ve ever made (and I’ve made a lot of quinoa). I discovered this site yesterday and knew immediately I had to try this recipe. I added a seeded serrano pepper to the ingredient list. Delicioso!!! I can’t wait to try 2 other recipes tomorrow. Can’t wait to try this!! Awesome gluten-free option!! You ladies should consider tagging recipes as GF when they naturally are, definately a huge help for us! I’m new to your website, but I laughed out loud while just reading your recipe. I love your humor and the salad looks delicious! Delish!!! I wish there was a facebook “share” button for each of your recipes. Everyone needs to know how yummy this is! This is a great recipe! I made this two nights ago and actually like it better now that it has had a chance to sit than I did when it was fresh. I boiled some chicken and diced it up to put in – I think it helps to cut the lime & vinegar taste a little. I also diced an avocado which is a great addition! 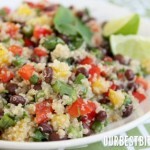 My friend Maria shared this recipe with me from your site and we enjoyed this Quinoa Salad by the spoon full. We did not have mango but pinapple was substituted instead. I can’t wait to try it with mango. So Yummy and did I mentioned it was my first time trying Quinoa as well. Thank-you! This salad rocks!!!!! My husband and I loved it and I’m sure it will be a staple in our house and party salad to come! I’m making this for dinner tonight. I can’t wait!! I’m making this for a family get together–any ideas of what to serve with this? I love it with simple grilled chicken like I mentioned in the post! Thanks for another awesome recipe! My husband and I both love this. I like to make it to jave in the fridge for lunch, and send it with my husband to work. 🙂 so so good. made this for dinner last night and we even loved it w/out the dressing. Light and refreshing. My husband commented that it was the best tasting quinoa salad to date. I cooked the quinoa in chicken broth for more flavor and it was beautiful. I couldn’t find plain quina at my store. Can I use couscous instead? Sure Erin, that would probably work just fine! I made this last night and it was amazing!! Thanks for the awesome recipe! I had a mango I needed to use up and some leftover quinoa but no green onions, no cilantro, no red wine vinegar. 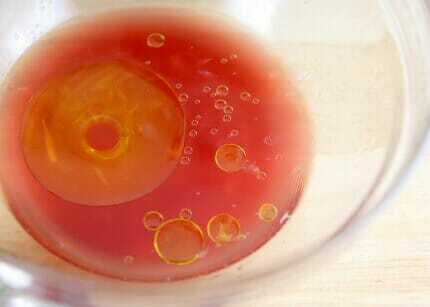 Sooo, I did a couple T.spoons diced red onion and used apple cider vinegar. Its really yummy. I’m sure the original has more depth, but this totally works! Thanks for the rezept! I can’t remember if I’ve commented on this before, but it is SO GOOD. Thanks for a great recipe. It was instantly put into my regular rotation of recipes. I love it! Oh– and FYI: When I first started making this, it was during the summer and I had a lot of yummy mangoes around to use up. Lately I haven’t had fresh mangoes, so I’ve been using frozen. Just thaw them slightly, chop them up, and then they’ll thaw the rest of the way very quickly. They keep a really nice texture after they’re thawed. One of my favorites! I even just took this to a family party and everyone wanted the recipe. I absolutely love this salad! It’s become one of my favorite lunches since finding the recipe a few months ago – I’ve made it so many times. I almost always substitute red onion and green peppers just because that’s usually what I have on hand. 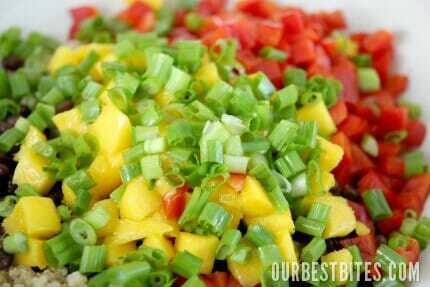 I have also used a peach in place of the mango or used frozen mango instead of fresh – both work well. In a pinch once, I also substituted lemon juice for the lime juice (the salad was totally made before I realized I didn’t have a lime). All in all, a great recipe that has made me love quinoa. Enjoyed this recipe a lot! I added feta cheese – very yummy! 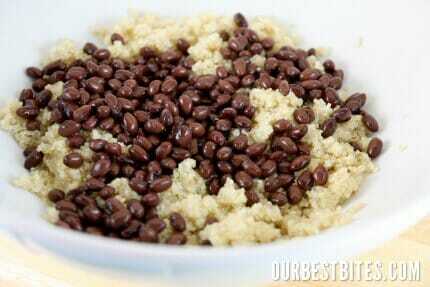 This is an awesome recipe- the best quinoa recipe I’ve ever had! Simple to make, loads of healthy ingredients and a great taste. A real winner!!! This has got me more yummy noises at parties then anything else. I usually add an avocado, some sliced string cheese and baby tomatos (if I can’t find the mango). This is a winner everytime! Hey Sarah, I just wanted to tell you how much I LOVE this recipe! 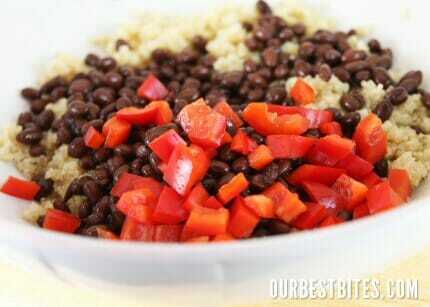 It is my favorite way to eat quinoa, hands down! I make it a LOT and take it to get-togethers and it is always gobbled up with no leftovers! I will be sad when mangos go out of season!! But, I’ll make it anyway! Thanks again, it’s just fantastic! Wow, you DO look like her!! My friend just made this and passed along the recipe to me. So delicious! I made this yesterday for a 4th of July BBQ and it was a big hit! Even my somewhat picky teenage step kids liked it. I love the lime and mango melding of flavors. I went off the quinoa package directions for cooking (same as OBB blog post on how to cook quinoa) which is to use a 1:2 ratio of quinoa and water. It turned out mushy for me. I rinsed and soaked it as well. So I went with a 1:1.5 ratio the second time and the quinoa turned out nice and fluffy. (I also toasted the quinoa right before cooking–supposedly it adds a more nutty texture or flavor). 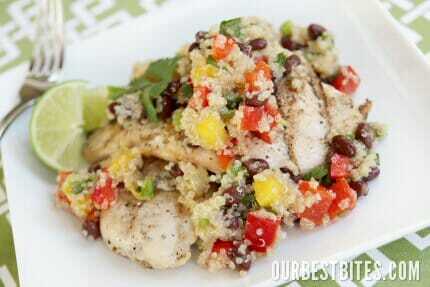 Great quinoa salad recipe with a southwest flair. I like the minimal ingredients needed for the dressing. Planning to pack this up for lunch tomorrow and eat with an avocado. Thanks so much for this yummy, healthy recipe! Tried this tonight. In a word, AWESOME.